This page contains information about web-based and hard-copy resources relating to literary archives and manuscripts and will be added to over time. Click on the options below for further information. Only one of these resources is specific to literary manuscripts, but there are various other more general resources which provide access to information about, and catalogues of, literary archives and manuscripts. An invaluable resource for those interested in finding archives and manuscripts relating to all aspects of twentieth-century literature, maintained by Reading University Library. It records information about literary manuscript and archive material held in all types of repository in Britain and Ireland. The authors represented (both literary and popular, writing in all genres) are English, Irish, Scottish and Welsh writers who used the English language. However, the resource also includes writers of other nationalities who spent a considerable part of their lives in the British Isles, and Victorian writers who lived beyond 1899 are also included. The database contains all the information published in the original hard-copy Location Register of 20th-Century English Literary Manuscripts and Letters (British Library, 1988), along with additional data collected for the 2003 Supplement to the Location Register. The level of description is broader than item level but narrower than collection level; entries include a brief description of the material (which includes literary manuscripts, letters and ‘personalia’ such as photographs, recordings and proofs), dates, name of the holding repository, call number (which usually identifies the collection of which the material forms a part), and access information. Resource provided by The National Archives which allows you to search for individuals by personal name or institutions (e.g. publishing houses) by corporate name. Search results give a brief description of the papers, the institutions in which they are held, and reference to a finding aid or other resources which supplies further information. You can also link directly to the website of the repository which holds the papers you are interested in. Annual survey by The National Archives of new manuscript accessions to over 200 repositories throughout the British Isles. This includes a Literary Digest which lists annual major accessions to repositories relating to Literary History. The Archives Hub provides a single point of access to over 20,000 descriptions of archives held in more than 160 UK repositories (libraries, archives or special collections departments, mostly in the Higher Education sector). Most of these descriptions are at collection-level, although complete catalogue descriptions are provided where they are available. While these are descriptions of archives covering all subject areas, it is possible to search on individual names, or by subject, in order to identify literary material. A2A allows you to search across detailed archive catalogues from around 400 repositories in England and Wales. This resource includes papers held in local authority and other archives as well as some HE institutions. Searches can be carried out on personal names, and advanced searches can be carried out by subject, e.g. literary history, which will bring up hits for those archives which have been indexed using these terms. Janus provides access to catalogues of archives and manuscript collections held in Cambridge – in both University and non-University repositories. 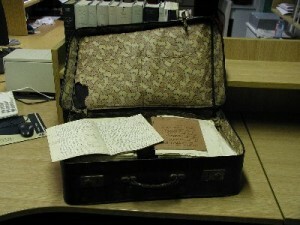 It includes many literary collections and numerous collections which are not represented in the Archives Hub. It includes a mixture of collection level and more detailed catalogue descriptions. Provides access to collection-level descriptions of archives held by record offices, universities, museums and libraries in Wales, including the National Library of Wales. Numerous literary collections are represented, as are repositories which do not contribute catalogues to the Archives Hub. Provides an access point to catalogues (mostly at collection level) of archives – including literary papers – held in more than 50 Scottish repositories; the repositories represented include the National Library of Scotland, universities, local authority archives, museums and others. AIM25 provides access to collection-level descriptions of archives held in over ninety higher education institutions and learned societies within the greater London area. The proportion of literary material is not high, but it may be possible to pick up on archives here which are not included in the Archives Hub gateway. An additional Vol. 5 (compiled by Ian C. Cunningham and Andrew G. Watson) was published in 2002, and constitutes an index to the first four volumes; a variety of indexes are supplied, including authors/titles, owners, dates, etc. These first two volumes will, in due course, be superseded by a new, expanded, online Catalogue of English Literary Manuscripts 1450-1700 which is currently being compiled by Peter Beal. See http://ies.sas.ac.uk/cmps/Projects/CELM/index.htm. • Part 2: John Gay-Ambrose Philips. • Part 3: Alexander Pope-Sir Richard Steele. • Part 4: Laurence Sterne-Edward Young. Includes an index to all four parts. The Location Register of English Literary Manuscripts and Letters: Eighteenth and Nineteenth Centuries, 2 vols, ed. David Sutton (London: The British Library, 1995). This overlaps chronologically with volumes 3-4 of the Index of English Literary Manuscripts, but differs in that it is much more inclusive in terms of the authors represented, and it also includes correspondence, which was excluded from the Index volumes. Entries for each author include an alphabetical list of literary manuscripts, followed by descriptions of letters and other papers, as well as holding repository and call number. An invaluable database of copyright contacts for writers, artists and prominent figures in other creative fields, which is run jointly by the Harry Ransom Center (University of Texas) and the University of Reading Library. This service offered by The National Archives provides advice to professionals in a number of areas, including collecting policies, deposit agreements, and purchasing archives and manuscripts; it also operates a sales monitoring service which archivists can contact with queries relating to market prices and purchasing collections. Authors and their Papers has reached this, its latest form, in a pleasingly collaborative way. The absence of such a document, especially for literary authors, became a theme for discussion during the workshops run by the Diasporic Literary Archives Network, and a first draft was assembled by DLAN members. That draft was then edited and expanded from the perspective of literary archivists, by members of GLAM, and from the perspective of authors themselves, by staff of the Society of Authors. Following positive discussions at the GLAM meeting in Aberystwyth in September 2014 and the DLAN meeting at Yale University in October 2014, the new expanded version was given an extensive editorial revision by members of staff of the National Archives. We feel that it is now nearing its final version.